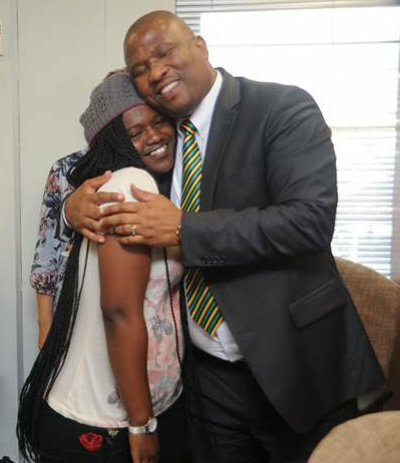 MEC for Finance and Economic Development in the Eastern Cape, Lubabalo Mabuyane gives a hug to Unathi Martins (18) from the Thamsanqa Community Project in Motherwell, Port Elizabeth. The Eastern Cape MEC for Finance and Economic Development, Lubabalo ‘Oscar’ Mabuyane took time off his busy schedule on Tuesday (yesterday) to join a hand over of gifts at the Coega Development Corporation (CDC) to orphaned, abused and neglected children housed with the Thamsanqa Community Project in Motherwell, Port Elizabeth. The initiative, which saw more than 38 kids between the ages of one (1) and eighteen (18) receiving shoes, clothes & stationery forms part of the MEC’s pledge with entities under the DEDEAT (Department of Economic Development, Environmental Affairs and Tourism) banner to provide opportunities for those less privileged. “When I was informed that this is taking place, I thought to myself, let me come and join our future leaders, because as a government we are well aware that, any country that does not invest in its youth does not have a future,” said Lubabalo Mabuyane, MEC Finance & Economic Development. One of the bright sparks from Thamsanqa Community Project in Motherwell joined the centre at a very young and is currently completing grade eleven (11) with plans to go to university. “I want to become a medical doctor when I am older; I am inspired by how they can heal us when we are sick. I also want to heal other people when I am older,” said Unathi Martins.